I developed a visual tool and methodology to help anyone at Indiegogo to see the entire user experience across all touchpoints. Indiegogo is a crowdfunding site based on a two-sided marketplace model where campaigners launch campaigns to raise funds for their ideas, and backers view and contribute to these campaigns to help make these ideas become a reality. The product and design teams at Indiegogo work on product experiences and features across this two-sided marketplace, with dedicated designers and engineers focusing on either the campaigner or backer experience. Although this helps teams gain deep domain knowledge and expertise in solving problems for a particular persona, we found that in a fast-paced organization, it was difficult to get a grasp of all the product initiatives that were happening at any given time. There simply was no representation of the entire product model aside from the product itself. Our goal was to create a visual tool that represented the entire Indiegogo product experience for both campaigners and backers. 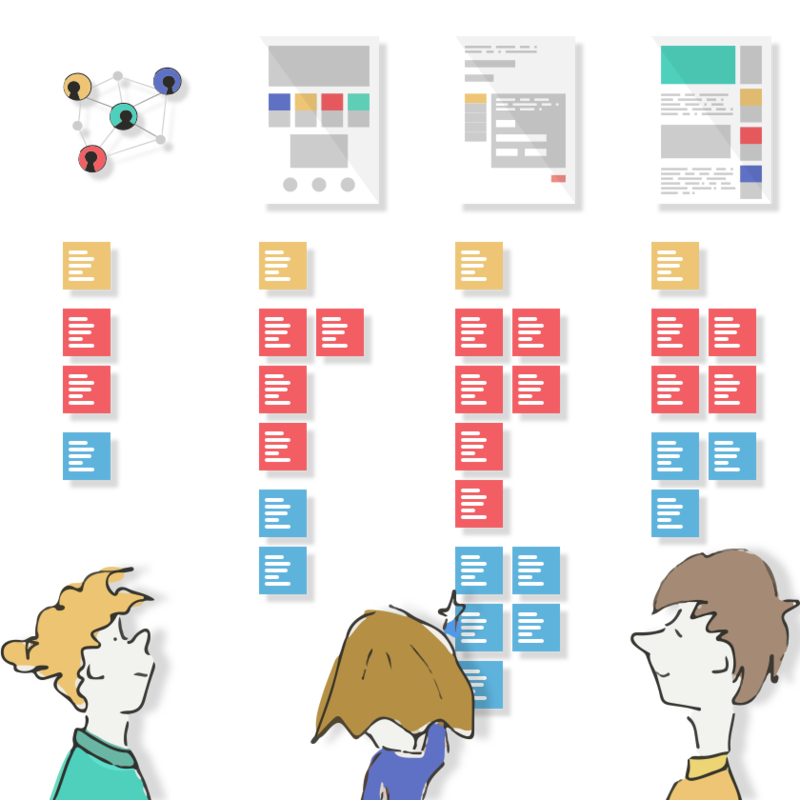 We created and introduced The Experience Wall and devised a methodology around it that not only helped the product teams align, but can be used by anyone at the company to see the entire customer journey in context of all the touchpoints. The Experience Wall displays this information in the context of what campaigners and backers are trying to do using the Indiegogo platform and where they go (touchpoints) do to it. The Experience Wall is modeled after journey mapping artifacts that myself and my colleague have created in the past. All the touchpoints shown on the wall such as product interfaces, off-platform events, or Indiegogo employees who interact with customers (such as sales agents and campaign strategists) are mapped along the journey. The wall shows the user goals and any pain points they are experiencing. We believe that understanding the bigger picture helps us validate what we are working on and informs strategic decisions to improve the product experience. There is a reason we call it The Experience Wall. We didn't want to create a tool that is only used by designers. We believe that design thinking is for everyone and we wanted to create something that encouraged engagement and participation from the entire company. The entire installation is about 28 ft. long using 7 separate boards- each large foam core board is 4 ft. wide and 8 ft. tall. The light foam core boards are modular and allow us to move the installation around the Indiegogo offices to help raise awareness and gain more exposure to the tool and methods. We also thought about the fidelity of visualizations on the wall. We didn't want to create something that seemed complete, but rather something that invited edits and amendments by anyone. We designed all information to fit on colored 3"x 3" sticky notes, and encouraged people to grab sticky notes and add any insights they might have. Each of the Indiegogo touchpoints shown on the wall were hand-drawn. I sketched them on an iPad and then cleaned them up as vectors in Illustrator. We printed them on paper and used a repositionable glue stick to apply the touchpoints to the wall. This technique allowed us to digitally capture any hand-written notes and print them on 3"x 3" colored paper to match other sticky notes on the wall. My intent with the lo-fidelity sketched touchpoints was to communicate an idea without having it be an exact representation of our product. We explored a number of active and passive techniques to encourage participation with the wall. At first, we held design team meetings in front of the wall. The design team used it to share what projects each member was working on. Due to the size and high visibility in the office, other team members such as product managers and sales team members were curious about the wall and its purpose. It began to generate interest and excitement within other teams. Our idea was spreading. We set up meetings with different teams and held informational sessions to educate people how to use the wall. Our customer support agents began using the wall regularly to highlight key pain points they would hear over and over again when working with customers. At quarterly company meetings, we would make company-wide announcements to raise awareness about the purpose and value of the wall. 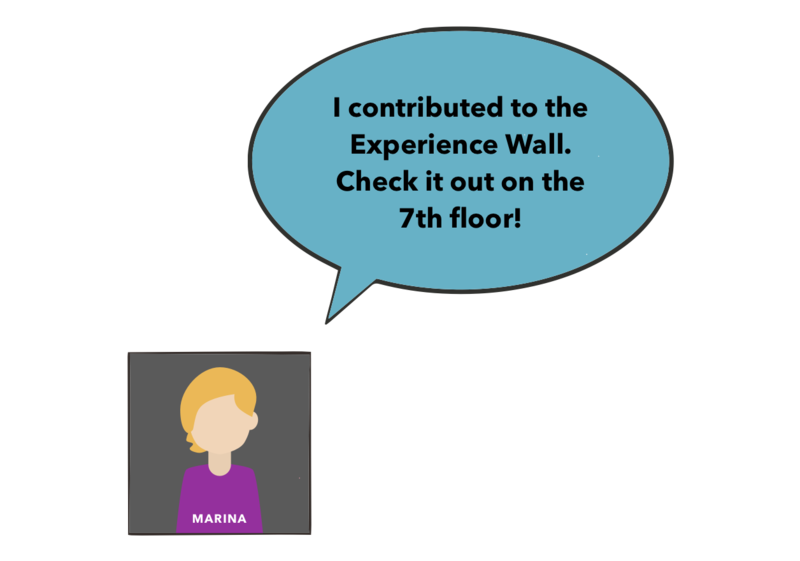 We also used passive techniques such as posting little reminders with avatars of people who already contributed on conference room doors or elevators to let people know that The Experience Wall is for everyone to use. The last thing we wanted was for The Experience Wall to be another forgotten tool or process. Our goal was to try our best to supplement existing systems and methods that were already in place, instead of replacing and introducing new methods. So instead of telling people how to use the wall, we asked people about what they already doing to make product decisions. We figured out ways to incorporate the wall into their processes, and we are actively working on improving the integration and use of it. We also wanted to figure a method to keep the wall up-to-date and easily maintained, and have developed a process to not only keep the physical wall updated, but to have a digital copy of it as well. Finally, we wanted to inject an element of delight with the wall. This is part of why I sketched each touchpoint by hand to give the wall a more friendly and inviting aesthetic. As we started to gain momentum within the company, and more and more people began interacting with and contributing to the wall, so we wanted to celebrate each person's contribution and thank them for taking part. We did this by creating a custom illustration avatar for each person that contributed and shared this openly on the wall for everyone to see. The simple reward of seeing your own avatar as recognition has encouraged others to take part in the wall as well. Our goal is to get an avatar of every Indiegogo employee onto the wall. Since its installation, we've seen product managers and campaign strategists use the wall on their own. 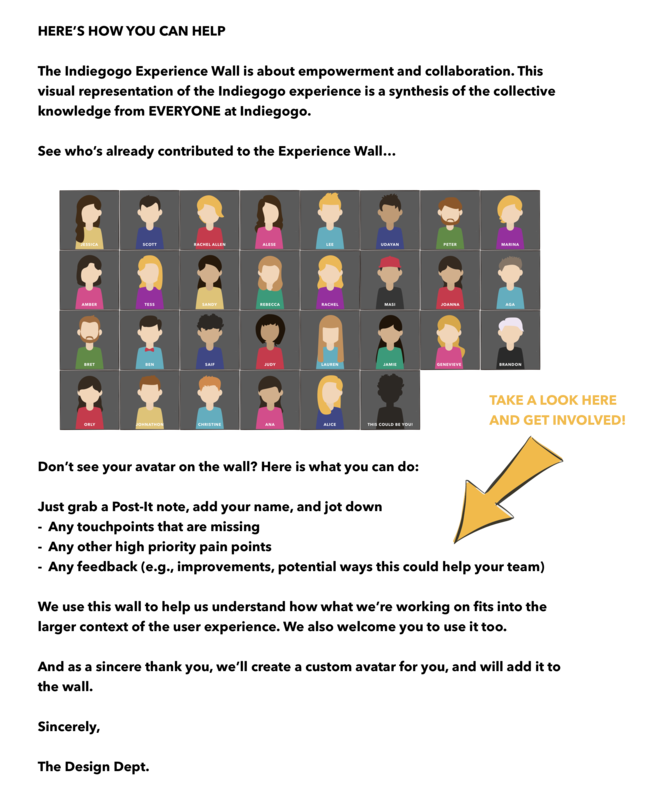 The wall has helped expose assumptions about our customers and has provided an easy way to share this with many people. 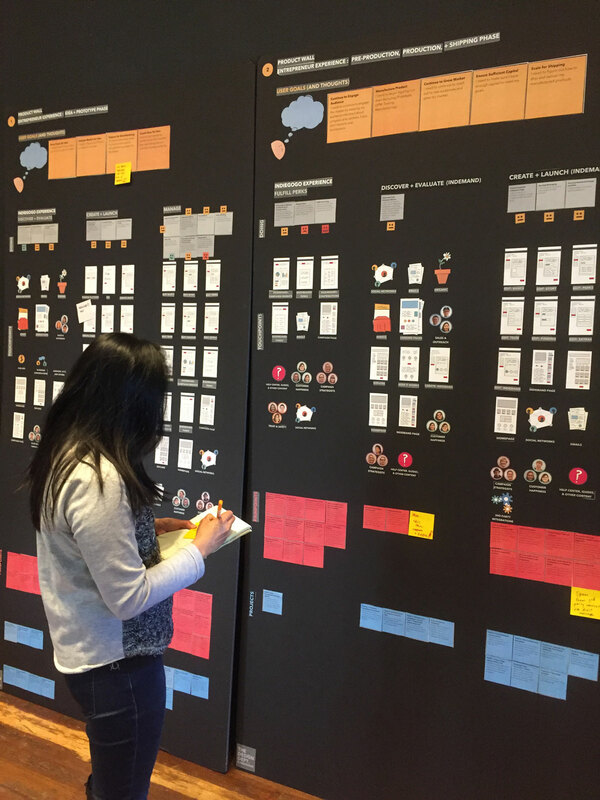 We've received emails from product managers saying how the visual tool has helped them plan their product roadmaps, and executives have been using the wall to plan yearly and quarterly company OKRs.